My son, Charlie, really isn’t into movies as his attention wanes dramatically about halfway through. Pixar’s WALL-E was the exception. Between the space setting and wonderfully emotive characters, he was captivated the whole way through. 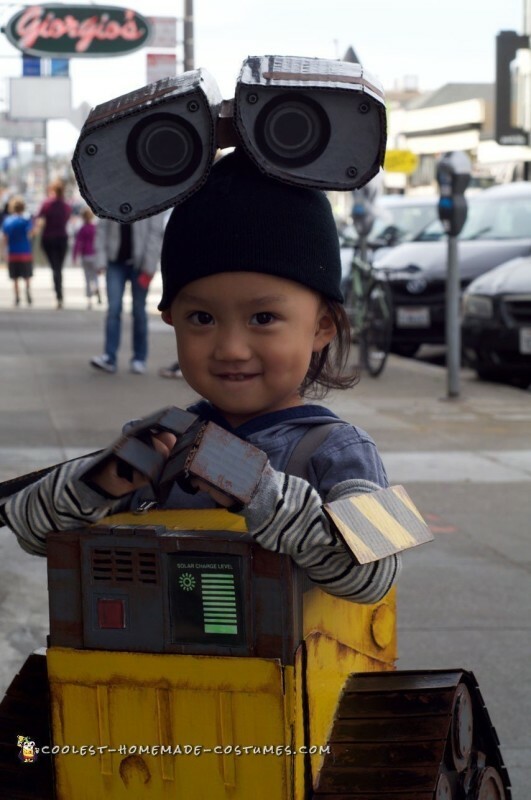 Shortly after, he asked me if he could be WALL-E for Halloween. 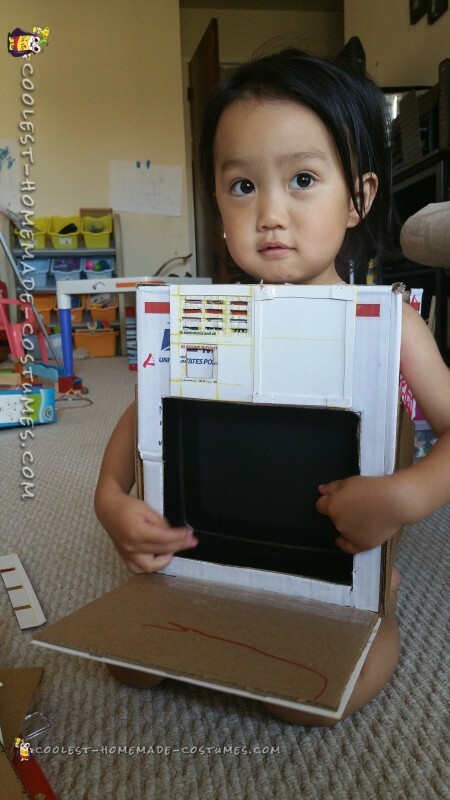 Now I had seen store bought costumes before, but I’ve always enjoyed building things myself. So I promised I’d do everything in a month’s time to make it happen. I imagined how fun it would be to assemble it together and how happy Charlie would be wearing it. That was all the motivation I needed. WALL-E started off as one USPS cardboard box which I selected because I felt that it was the right size for his small frame. 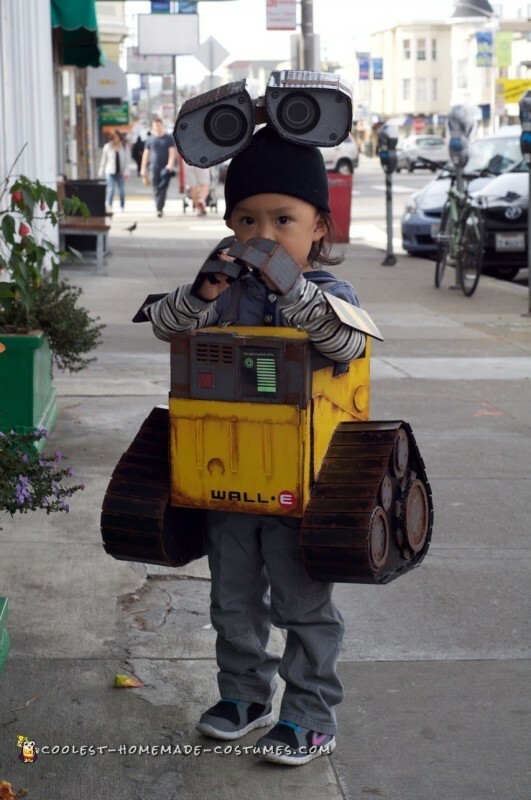 I had seen several WALL-E costumes online that while cool looking in their own right, seemed cumbersome to wear. I wanted Charlie’s costume to be easy to maneuver in as well as put on. If I was going to spend a lot of time on his costume, it needed to be something he wouldn’t be racing to shed as soon as he put it on. It needed to be comfortable. In fact I decided early on that I wanted 90% of his costume to be composed entirely of cardboard because it was lightweight. Not to mention cheap and sturdy enough to withstand layers of paint. 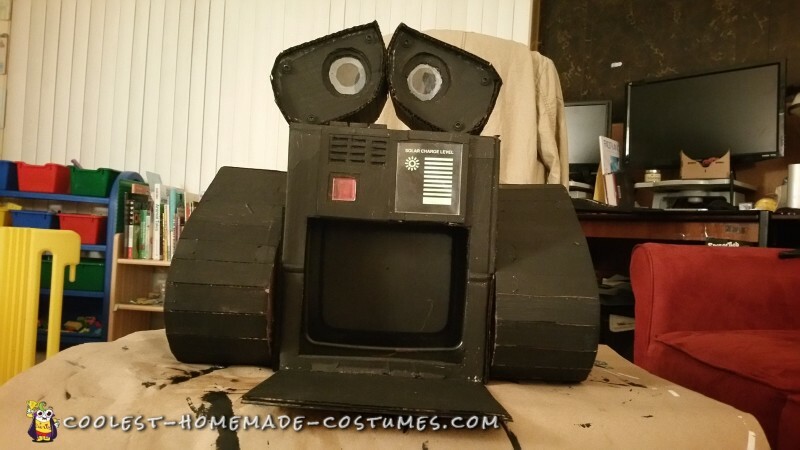 Using a combination of meticulous measuring and hobby knife slicing, I turned many scraps of cardboard into individual WALL-E parts (gears, tracks, panels, eyes, etc.) which I would glue and tape together later. In actuality, there are only four non-cardboard pieces. The red button below the vent is a glass tile. The solar panel is plain paper painted with glow in the dark liquid. Then the eye piece uses plastic cloth diaper “snaps” to act as the screws and also uses cut pieces of plastic packaging for the lens. The hard part was definitely deciding which details were essential in creating his look, and which parts were not. I didn’t want to get too far engrossed in making his form look identical to the source material that I wouldn’t have time to paint it. There were several instances where I realized that I was blurring the line between effort and obsession (e.g. installing lights and a battery pack). Eventually the easiest way to make the hard cuts was to remember that a 3 year-old had to carry it all himself. Once I started to picture him buckling under the weight of my madness, trimming the fat became much easier. The arm/hand pieces were actually the last things I made because I had just enough time to spare to make them. My wife was already happy with what I had created so far and told me that I didn’t have to make them, which totally meant I did. I cut to size articulated gloves, cut/painted upper arm panels, then hot glued them both to a pair of my son’s leg warmers. I would say that far and away, the moment I knew that I had made the right decision in building the costume was when Charlie tried on the arms. At one point, he started to pretend he was flying. 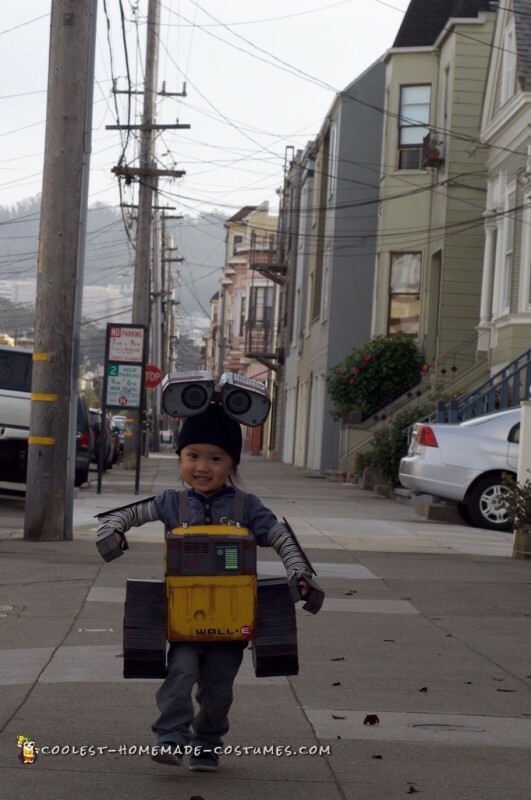 Our trial run for his WALL-E costume was at Charlie’s preschool. Seeing him in full attire after all that handwork was surreal. It warmed my heart to see him so excited and proud. All the stress and frustration through several sleepless nights dissipated after seeing him so happy to be wearing it. Between the walk outside, to the party, we received many flattering compliments from acquaintances and strangers alike, regarding both the craftsmanship and absolute cuteness of him wearing it. His character being one of the things that made me brave enough to tackle this project. Because I knew that Charlie’s spirit and general enthusiasm would always by default make the costume look better, no matter how it turned out. Since then I’ve shared Charlie’s costume on social media and have probably received the most likes/shares/comments since his birth. One of those shares even made it’s way to Jem and the Holograms director, Jonathan Chu, who subsequently “liked” it himself. 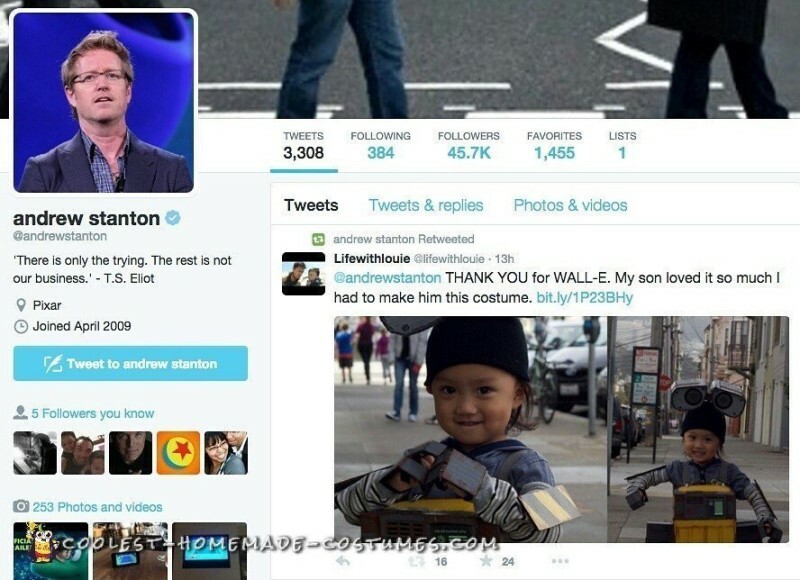 Charlie’s costume was then retweeted by Pixar bigwig Andrew Stanton, the director/creator of WALL-E. When I saw that notification I raised my arms in silent triumph before suddenly breaking down into happy sobs mixed with wide grins. It was incredibly validating to be recognized for my efforts but more importantly the great love I have for my son. Just knowing that I have this awesome story to tell him as he grows older is such a gift. In total, I am floored by the response and already can’t wait to see what we can do for next Halloween.